Wow!!! That was the first thing I said when I opened my card from Michelle, who was my partner in Teri's card swap for March. My husband brought it home since she didn't think it would be a good idea to mail it. I'm glad it didn't come in the mail because it would of gotten squashed. I love this card!!! Thanks so much Michelle!!! See that little kitty in the shaker box? Well, I kept looking at it when I got it because I couldn't tell if it was shrink art or if it was stamped and cut out. Anyways, it's way too cute and I love Hello Kitty! Tomorrow, I'll post the card that I made for Michelle. So stay tuned. This past Saturday I did a make & take at my husband's store. I was quite surprised with the huge turnout since Saturday was very rainy and cold and there were so many things going on the same day at the same time. But everyone had fun and I'll be seeing them again this coming Saturday at Ben Franklin Crafts paper party being held at the Mapunapuna store. Here's a picture of the make & take we did. 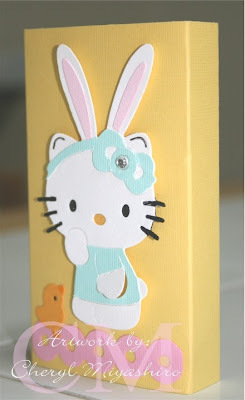 We covered a Necco candy box with the new Hello Kitty Easter bunny ears die. 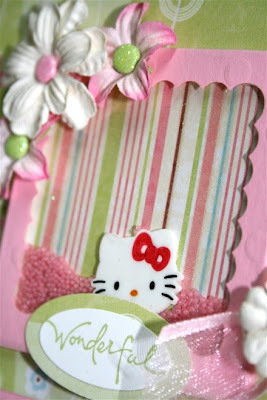 We used 3 different Sizzix dies that was just released for April's spring release. The cute pink trim is a deco strip die called trimmings. The little chick is from the bunnies & chicks sizzlit die. Well, thanks for stopping by this evening and hope to see all of you again at the paper party! Hi Cheryl! You're so lucky! The RAK from Michelle is adorable and the candy box is precious! I love Hello Kitty! =) Have an awesome day! Such a cute, cute card from Michelle!! So creative with that HK head in the shaker box! Sad that I missed your MITI but then again, I would still be there trying to figure out the kitty pieces! Thanks for sharing! I can't wait to see the card you made for Michelle!! 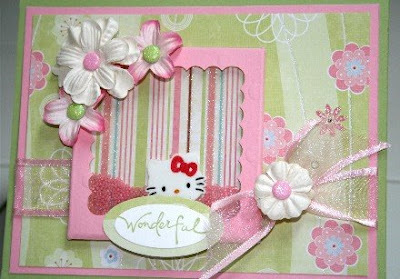 such a cute card...and love your make n take! those HKs are always so sweet to add to any project! Oh I am so glad that you got it safe and sound, lol! The little Hello Kitty is shrink plastic :0). Love your little make and take and now wish that i bought the little chickies to go with my new Easter HKs, oh well. Take care! Oh love the make and take, seeing all these HK dies just brings me back to my childhood. Must be dream to be able to open up your own shop and play with fun crafts all the time.